Aside from the amazing apartment and the views, the receptionist was very nice and accommodating. I went there to get married the staff were especially helpful and went above and beyond especially event manager Moale Charmichael she is a credit to the hotel. Location is perfect view is amazing. Location, organization, clean, good value for money and it included all required items in an apartment. We stayed in a 'sub-penthouse suite' with ocean view on the 48th floor and the views were spectacular. The master bedroom and bathrooms are huge. It's right in the heart of Surfer's Paradise and the beach and boardwalk are right outside, which is fantastic. I have to give special mention to the assistant managers on duty as they were very professional and helpful. The turndown staff were also very friendly and the property had a good vibe throughout it. Lock in a great price for Peppers Soul Surfers Paradise – rated 9.1 by recent guests! Peppers Soul Surfers Paradise This rating is a reflection of how the property compares to the industry standard when it comes to price, facilities and services available. It's based on a self-evaluation by the property. Use this rating to help choose your stay! Boasting 77 floors and overlooking Surfers Paradise Beach, each apartment at Peppers Soul Surfers Paradise offers in-room WiFi, a spa bath and a private balcony with uninterrupted ocean and hinterland views. The property features an outdoor pool, a spa pool and fitness center. Peppers Soul Surfers Paradise is located on Cavill Avenue, just yards from many shopping and dining options. The Star Gold Coast is a 5-minute drive away, while Gold Coast Airport is a 30-minute drive away. Each of the modern, air-conditioned apartments offers floor-to-ceiling windows, a fully equipped gourmet kitchen, laundry facilities and private bathrooms with slippers. All include a lounge area with a flat-screen satellite TV. Dental kits, shaving supplies and additional toiletries are available at reception. Guests can relax in the sauna, or admire the ocean views from the poolside terrace. The property also features barbecue facilities set in landscaped gardens. During Chinese New Year, and other celebratory times Chinese breakfast is available. Surfers' Paradise is a great choice for travelers interested in theme parks, sandy beaches and beach walks. 뀐 Located in the real heart of Gold Coast, this property has an excellent location score of 9.6! When would you like to stay at Peppers Soul Surfers Paradise? This apartment features a view. This luxurious apartment features uninterrupted ocean and beach views. It includes a fully self-contained living area, a spacious furnished balcony, 2 bathrooms (one with spa bath), two 40-inch LCD TVs and iPod docking station. 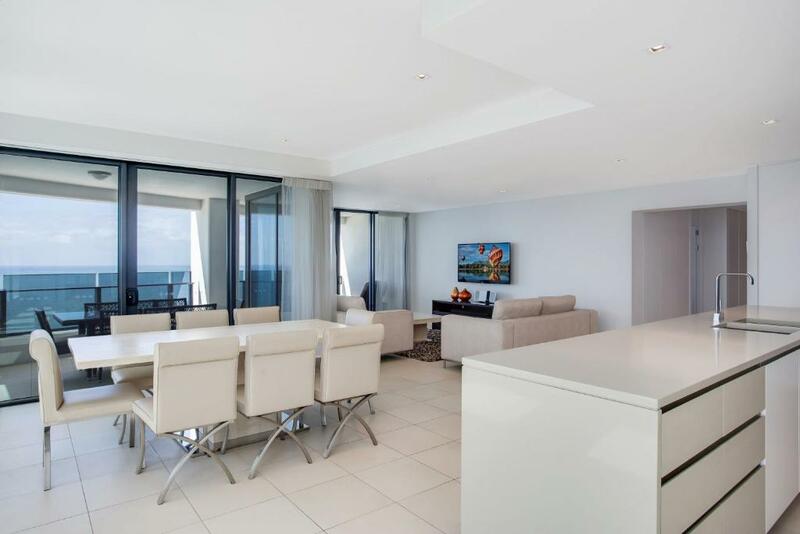 This apartment is on the 'Sky-Rise' floors, and offers floor-to-ceiling windows with panoramic views of the ocean, beach coastline and countryside with east and west facing balconies. Fully self contained with 2 flat-screen TVs and spa tub in the master private bathroom. This apartment features a bathroom with a shower. It also includes a view. This 3-bedroom apartment provides a luxury escape. It has floor-to-ceiling windows and a spacious private balcony. The stylish living spaces include a full kitchen, 3 bathrooms, and laundry facilities. Area Info – This neighborhood is a great choice for travelers interested in theme parks, sandy beaches and beach walks – Check location Excellent location – show map Guests loved walking around the neighborhood! House Rules Peppers Soul Surfers Paradise takes special requests – add in the next step! A AUD2000 damage deposit is required on arrival (around USD1407.30). This deposit will be fully refunded 7 days after check-out, as long as there isn't any damage to the property. Peppers Soul Surfers Paradise accepts these cards and reserves the right to temporarily hold an amount prior to arrival. Please note that this property does not have any policies, procedures or resources in place to accommodate the unique needs of school graduates during the annual 'Schoolies Week' period. Please note that the indoor pool, indoor spas, steam room and sauna will be closed from 13th May 2019 to 17th May 2019. However, the outdoor facilities will be open during this period. A damage deposit of AUD 2000 is required on arrival. That's about 1407.30USD. This will be collected by credit card. You should be reimbursed within 7 days of check-out. Your deposit will be refunded in full by credit card, subject to an inspection of the property. For some reason the elevator is slightly slow, sometimes 5 or more minutes are expected to await. Restaurant is a little disappointed, I expect a bit more for a 5 star hotel restaurant. It is not bad, but should be better. Good location, cannot be easier than this, best location. Great service, people are welcoming, helpful, and nice! Housekeeping is also excellent. We are very disappointed for breakfast, not worth on price. Compared to some of the other places in GC rooms were bit small. Master bedroom was fine. The cooking pan is not easy to use. Pillows are two high for me. Would like to have more options of pillows. the location is the best. Warm swimming pool with stunning view in the twilight time. Facilities are very new and stylish. Only thing that was annoying were the taps - they are kind of switch taps for hot and cold. The cleanliness of the apartment was disappointing. On arrival there was a half empty bottle of Moët in the fridge, the deck both sides had litter and debris, the safe had an empty milk carton in it, the toilet roll holder in the second bathroom fell off the wall, the remote in the second bedroom didn’t work, there was chewing gum on the blind, the pillows were very hard and stains on the carpet where the single beds were. Maintenance is poor. The kitchen taps and sink were a nightmare as every time the tap turned on it sprayed water everywhere and saturated the bench. A real design problem.I called reception to clean up the bottle and deck as it was a disappointing start to our stay. Please check fridge and safe after people have checked out. We thought the location and facilities of the hotel excellent. Pool and BBQ areas beautiful. Concierge staff fantastic.